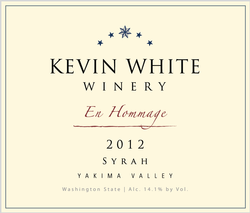 En Hommage opens with aromas and flavors of blueberries, violets, black currants and plum. Additional nuances of black pepper, minerality and spice complement the driving blue fruit flavors with refined tannins that wrap around a smooth, refined and delicate core. This wine pairs nicely with grilled pork tenderloin, lamb chops, and hearty Italian dishes. A collection from 4 of our best barrels in the winery, this wine intrigues with dense aromas of blackberry, plums, violets, black pepper and thyme. On the palate you find these flavors wrapped around a plush, silky medium body with fine tannins lending balance and structure. A very enjoyable wine to drink now but will continue to evolve with another year or two in the bottle. Pair this wine with grilled meats and hard cheeses. A blend of one barrel of Boushey Mourvèdre and one barrel of Sugarloaf Vineyard Mourvèdre. Only 46 cases were produced. This medium body wine exhibits all the traditional spice, pepper, leather and raspberry flavors well known for this varietal. A great wine for grilled food this summer! This wine jumps out as a lively blend of Bing cherry, plum, and blueberry aromas with floral and spice elements throughout. On the palate, these flavors are wrapped around a medium body with soft tannins leading toward a lovely finish. A very enjoyable wine to drink now. Pair this wine with food any night of the week! Starting with the 2014 harvest, we decided to source additional fruit from our vineyard partners to create new barrel selection opportunities for the La Fraternité and En Hommage Rhone Blends. After finalizing the barrels which created those wines, and our special wine club blends, we blended the remaining barrels to release as our Red Wine. This wine is our tribute to the everyday Cotes du Rhone blends that are perfect to enjoy any night of the week. This Grenache, Mourvèdre, and Syrah blend is a lively wine with layered aromas and flavors of strawberries, raspberries, kirsch, violets and spice. On the palate, these flavors wrap around a silky medium body with a smooth, fresh and lingering finish. This wine pairs nicely with roasted chicken, grilled pork, Ahi Tuna and Salmon dishes. A blend of one barrel of Boushey Mourvèdre and one barrel of Olsen Estates Mourvèdre. Only 42 cases were produced. This medium body wine exhibits all the traditional spice, pepper, leather and raspberry flavors well known for this variety. A great wine for grilled food this summer! This wine intrigues with dense aromas of blackberry, plums, violets, black pepper and thyme. On the palate you find these flavors wrapped around a plush, silky medium body with fine tannins lending balance and structure. A very enjoyable wine to drink now but will continue to evolve with another year or two in the bottle. Pair this wine with grilled meats and hard cheeses. The 2012 La Fraternité pronounces bright red fruit from the moment you pull the cork. This Grenache, Mourvedré and Syrah blend is a lively wine with layered aromas and flavors of Kirsch, strawberries, raspberries, rose petals, white pepper and spice. On the palate, these flavors wrap around a medium body which is smooth and fresh. The 2012 En Hommage is a Syrah driven blend that opens with aromas of blueberries, blackberries, violets, black currants, and spice. On the palate, this wine is textured and plush with soft tannins in the background lending structure and balance to the wine. Additional hints of bacon fat, olive, and black pepper lend complexity and nuance to the driving blue fruit which stand out in this wine.